Composer Gustav Holst lived in the English village of Cranham for a while, and it was there, in the house now called “Midwinter Cottage” that he wrote what is probably the best known tune for the Christmas carol “In the Bleak Midwinter” by Christina Rossetti. That's why the tune is called “Cranham”. This version of the hymn has been recorded by a number of popular recording artists, including Julie Andrews, Allison Crowe and Sarah McLachlan, as well as by many choirs. 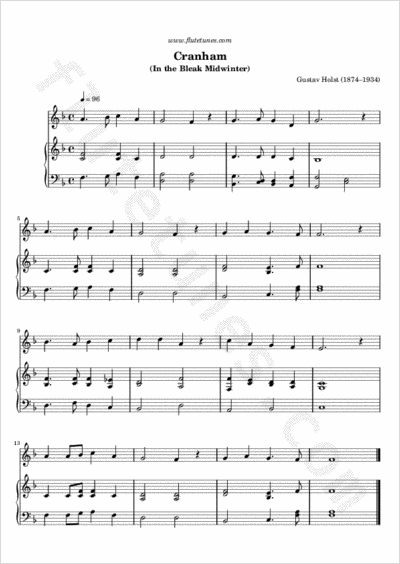 Another famous setting of the hymn was composed by Harold Darke in the early 20th century. The Darke version, with its beautiful and delicate organ accompaniment, has also gained popularity among choirs in recent years.